Crinums are the largest member of the amaryllis family. In the last century, this favorite heirloom bulb has become a staple of southern gardens. Crinums are a popular pass-along plant. They are often found on abandoned home sites long after the structures have faded away. Crinums have dramatic, strap-like foliage that cascades in a fountain form from a central stalk. There are variations in the foliage of a few cultivars. There is a rare “milky way” spotted variety and striped Crinum asiaticum ‘Variegatum’ – but in general crinum foliage is a glossy medium green. 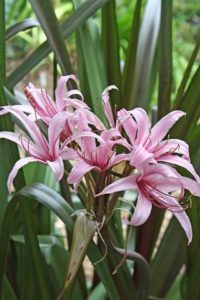 Crinum bulbs can grow quite large, sometimes weighing upwards of 25 pounds. Some cultivars produce a pseudostem – a sheath of tightly wrapped old leaves that form a “trunk”. 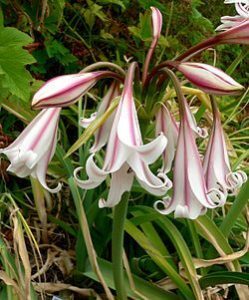 The largest central bulb is called the “mother” bulb once the crinum starts to pup (form offsets). Flower stalks emerge from the belly of the bulb below the foliage. They stretch until they stand well above the crown of the plant before the blooms open. Flowers are born in clusters at the apex of the stalk. Some are trumpet-shaped and others are spidery, depending on cultivar. They are available in a range of colors from white to pink to deep garnet rose. The “milk and wine” Crinums are white with pink stripes down the center of each petal. They bloom summer through fall, often shortly after a soaking rain or deep irrigation. Crinums are definitely a low maintenance plant. They tolerate of a range of soils, but perform best in beds prepared with adequate organic matter. They will tolerate short periods of drought but most Crinums prefer moist, well-drained soils. There are a few varieties that will grow on the banks of ponds. 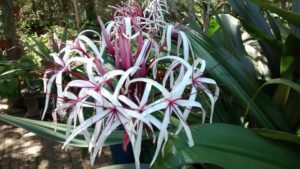 Crinums do not require heavy amounts of fertilizer to grow and multiply, but you will be rewarded with more blooms if they receive a top dressing of slow-release organic fertilizer 2 – 3 times a year. I mulch my Crinums to retain moisture and prevent weeds. I have used premium native mulch and I have used tree leaves and have observed little difference. Crinums are bothered by very few pests and are deer resistant. There is a fungus called Red Blotch Fungus which causes red splotches on the leaves. Copper-based fungicides are usually effective. Crinums do not need winter protection. In Zone 9 in mild winters, they will be evergreen. If a hard freeze occurs, their foliage will be damaged. Since the foliage tends to get mushy after a freeze, it should be removed soon after the weather allows. Crinum bulbs are hardy to Zone 7. Offsets can be gently removed and replanted in another location or shared with a friend. It is not necessary to remove offsets each year. They can be allowed to remain for years, developing a large clump. You can also lift the entire clump and divide it if you wish. Offsets and division can be done pretty much any time of year, but late winter is best, just before they begin active new growth. If cold weather is pending, just wrap the bulbs in newspaper, place them in a box, and wait until a stretch of pretty weather is available. Newly transplanted bulbs may not bloom for a year or two after replanting. Young offsets will take longer to bloom that larger divisions. Crinums can also be propagated by seeds. Fresh seed should be scattered over the surface of the potting soil soon after harvest. Do not store the seed. Press the seed against the soil to insure good contact. Water gently. The soil should be kept moist at all times. Crinum seed germinates quickly in warm, moist conditions. Separate the young bulbs when they become crowded in their container. I found my first crinum before I even knew what it was. A friend was moving plants from the garden of a house that had been sold. The new owners wanted all of the plants taken out of the backyard so they could start fresh. He thought the plant was pretty and called me to come take a look. I later identified it as Crinum x powellii. I still have it in my garden today. Crinums are available from several reputable mail order sources. Plant Delights Nursery and Jenks Farmer Plantsman offer beautiful selections. Marcelle Sheppard can rightly be called “the First Lady of Crinums” in Texas. Her collection and knowledge are equally amazing. I have spent hours reading her website and have visited on the phone with Marcelle. She is a delight.